Tamarind Kernel Powder is derived from the plant Tamarindus Indica. Tamarind is an evergreen tree. Various grades are delegated to Tamarind Seeds following which these seeds are methodically ground to powder conserving their nutritious properties, than these seeds are roasted and decorticated. The kernels of these seeds are separated by color sorter to obtain, rich tamarind kernel powder. Tamarind pulp is one of the souring agent in Indian curries. For the reason that of sugar and acid contents the tamarind pulp is used in kitchens for curries, sauces, syrups and other food beverages. Tamarind kernel powder-deoil and tamarind kernel powder-oil supply by Altrafine Gums. 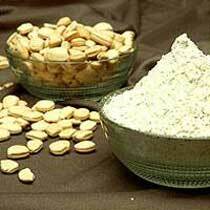 The white kernel obtained of tamarind seeds are utilized for producing Tamarind Kernel Powder. Tamarind kernel is rich in Protein, Carbohydrates, Fibers and Oils. And a little amount of Fibers, Sugar etc. Tamarind Kernel Powder has a high water absorption capacity. Due to its rich content of carbohydrates and protein Tamarind Kernel Powder is also used in producing adhesives. Tamarind Kernel Powder is also used in various food processing industries and applied largely in Ketchups, Ice creams, sauces, sherbet, baked food, pet food, meat product and instant noodles. Tamarind kernel powder for textile industry is used for different types of dyes, fabrics and textile printing applications. Tamarind Kernel Powder is used in food industries with its extensive applications in ketchups, Ice creams, Sauces, Sherbet, Baked Food, Pet Food, Meat Product and Instant Noodles. Excellent thickening property of Tamarind Kernel Powder makes it a good thickening agent for textile industries. It is also used for the purpose of textile sizing. The penetration and fiber forming characteristics of tamarind kernel makes it an exceptional element for the purpose of sizing in dyeing and printing industry. The deep absorption property of tamarind kernel also makes it useful in the process of jute sizing and cotton wraps. Having an attribute of high viscosity builder, tamarind kernel is used in paper and explosive industry. Having an excellent property of a soil stabilizer, tamarind kernel is also extensively used in oil drilling and gas industry.